Invincible in the face of stone throwing kids. After all, it’s open season on those who ask why? Cut his puny spine in half. At the moment his great heart burst. 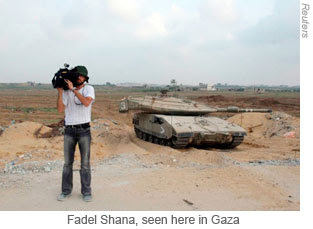 An Israeli military official said, "We wish to express sorrow for the death of the Palestinian cameraman ... It should be emphasized that the area in which the cameraman was injured is an area in which ongoing fighting against armed, extreme and dangerous terrorist organizations occurs on a daily basis. "The presence of media, photographers and other uninvolved individuals in areas of warfare is extremely dangerous and poses a threat to their lives." After 2 weeks in hospital, weeks without news, I see that nothing has changed and so I return to the fray.